I have a lot of friends and family born in February, I realized looking at my calendar this morning. I wonder why that is. Is this a popular month for birthdays or something? That really has nothing to do with today's post, it was just something that popped out at me. What this post is about though is recapping how my health goals and shopping ban progressed in January and to prepare new goals on that front for February. Care to guess what February's goal is? Not my shoes. Blue's not my color. 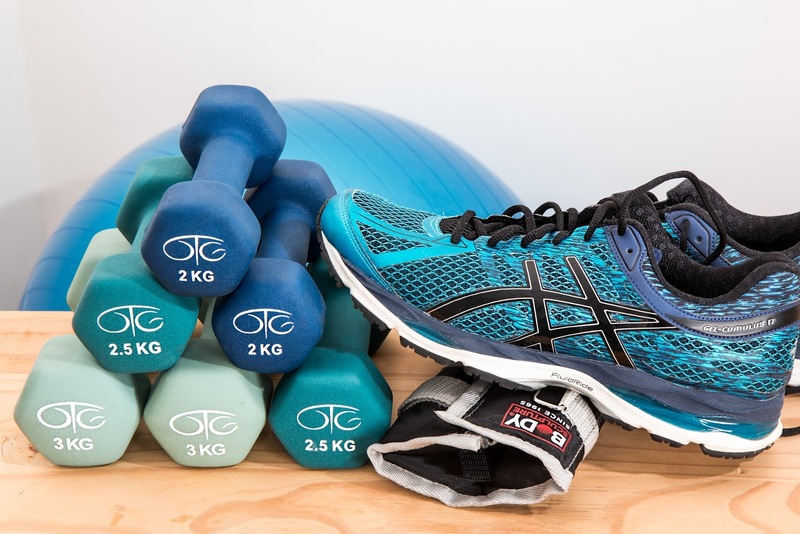 But yes, we're in fitness month now. First though, let me recap January. - So the first, main goal of January was to eat totally clean, which I've discovered I'm pretty darn good at. I think the shopping ban helped the most with this, since I banned takeout/food delivery. When I make my food at home, I know exactly what's in it and when I grocery shop, I don't buy things in packaging, which means there's nothing processed going into my cart. 95% of my diet in January was quinoa, black beans, avocado, and vegetables, which made this whole clean eating thing very easy. I don't know that coming months will be as successful as this, but I'm confident enough in what I'm eating that I don't need to continue to make this a goal - it's good enough most of the time that the times it's not won't really throw me off. - As far as the other goals on that list? No dairy and no sugar were a total success and not very difficult for me. Last year I started noticing how much dairy bothers my stomach so I really don't touch it much anymore, and definitely not at all in January. And I really don't like sugar very much, to be honest. I don't even eat fruit outside of lemons because I can't stand the sweet taste. So no desserts were had in January and also nothing with sneaky added sugar, like bread. The sneaky added sugar is harder to avoid when you're eating out, eating processed foods, and just things you didn't make yourself in general. But since spending money on eating out is off the table, I had to make everything at home, so I know exactly what was in every single dish. And it wasn't sugar or dairy. - The kitchen goals were a success too, of course. You can see my decluttered and organized kitchen here, if you missed it. - I have just a couple things to finish up on my current 101 in 1001 list, and the next one will be beginning April 1. I have 90 some items on the next one, though I'm not 100% positive on all of them. We'll see come late March, when I post the final list. But for now, I feel good about this goal and what I got done in January. - And the last goal, 15 times on the treadmill... I can't be sure. I want to say yes because that averages to every other day and I do think I did that, but I completely forgot I had made this goal so I didn't track it. Maybe a half pass on that one. Good thing my February goal is about exercise. $10 Netflix - I didn't pay this month. It's billed towards the end of the month and if I don't have anything I'm watching or want to watch, I just cancel it and restart when I want it. So I didn't have this bill in January, but I'll let you know which months I add it back on. $100 Cleaning Lady. Maybe this is a monthly bill too because it's every 4 weeks and not something we're willing to give up? But we may try extending it to every 6 weeks instead. I did pay with $100 that my mom had given me randomly late last year, so win for not spending out of my own pocket. $88 Valentine's Day Gift for John. I don't usually get him anything for Valentine's Day but there was something he saw that he wanted, so I got it while on sale. This isn't a shopping ban violation for two reasons: (1) gifts are allowed on the ban and (2) I used money I got from selling a $100 gift card to a restaurant I was never going to go to. One of the things I really wanted to concentrate on was using 'extra' money when I really needed to buy something, extra being blog earnings or Swagbucks, etc. so I'm glad that worked out this month. $27 Additional Valentine's Day Gift for John. Hawkeye got a hold of John's watch, which he needs for work, and chewed solidly through the rubber wristband. Which is odd, because she never chews stuff. So anyway she (me) ordered him a new one on Amazon and also threw in the phone screen protectors he needed. I used Swagbucks to earn the money for this, so still nothing out of my own money. $7 Groceries. Groceries are, of course, allowed during the no spend year. $16 at Target. John wanted garlic bread with dinner and I also picked up a mat for by our front door since we track so much snow in. However, John's mom gave me a $25 gift card to Target for Christmas so again, nothing spent. I'm still tracking gift card purchases though, for my own knowledge. $38 at Binny's. In my shopping ban rules, I actually said alcohol is okay and part of my grocery budget. I stocked up on vodka while they were on sale - bottles of Smirnoff, just $4 after rebate, plus tax. I use it when I go to bars and street fests, I put it in water bottles. With that plus some bottles I got from my mom, I should be set for the year, honestly! The rest of the Binny's bill was John's beer, I figured I'd just pick it up while I was there. $35 Phone Covers and Dog Collar. Since my parents got me a new phone, I needed a new cover for it, and I ordered one on Amazon while we were sitting around in the hospital after my mom's hip surgery. She found one she liked for her own phone, so I ordered that too, and a new dog collar because someone chewed the clasp on hers so it doesn't stay on anymore. I used Amazon affiliate earnings here too. $25 DietBet. I'm doing a DietBet in February with Megan, which is where you bet $25 that you'll lose 4% of your weight in 1 month. Everyone in the bet who loses their 4% splits the pot (you'll never make back less than what you bet, but you could win more.) So I paid in, but I'm not counting this in my totals or as a ban violation because I WILL win this money back come March 5! If for some reason I don't, then I'll count it, but I'm confident. $15 Vitamins. I got a 300 pack of multivitamins at Target. Used up the $9 on the gift card and $6 out of pocket. Total: $383. Total Cash: $151 ($51 Out of Pocket). Total Gift Cards: $232. I thought about counting the gifts in the months they will actually be given (February and April), but since I ordered them in January, I decided to keep it all in one place. More than half that monthly total is money that was spent on gifts, but thankfully 100% of that was fully funded by gift cards. So at first it looks like a big number spent, but it's actually not bad and nothing against what I intended to do with my shopping ban. So, I'm sure you're wondering about that $7 in groceries - win! I concentrated on eating from the pantry since it was my clean eating month, and because I had plenty of quinoa, dried beans, onions, garlic, and frozen vegetables. John did all the grocery shopping for himself and I just picked up avocados, lemons, and cucumbers. Also, my parents cooked a ton and delivered it to us. They officially retired at the end of 2017 and have all this new time on their hands, so they made veggie burgers and marinara sauce, baked potatoes, all kinds of things. When you're spending no money (even though groceries are allowed), you never turn down free food! 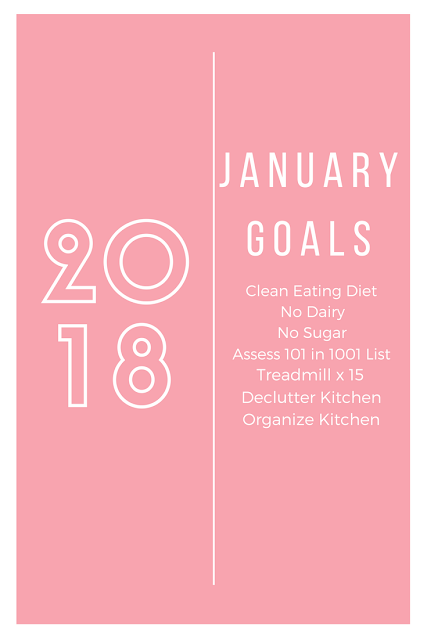 Like I mentioned in January's post and at the end of December, my word of the year is Healthy and I'm breaking that down into a smaller health related goal each month. Since January was about clean eating, February is going to be about incorporating exercise. 'Why, Stephanie, is that because you hate any and all exercise and February is the shortest month of the year?' Perhaps... 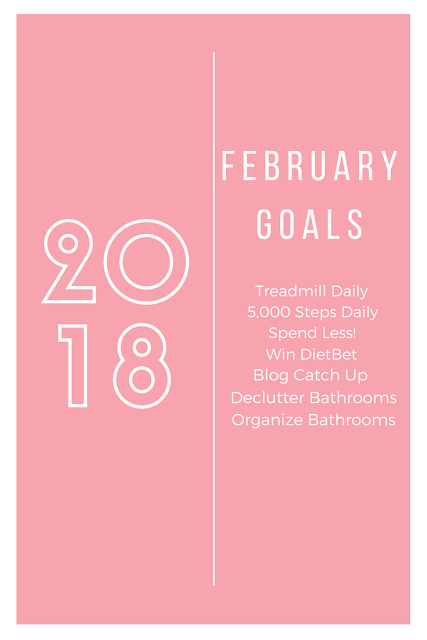 Anyway, yes, the overall goal for February is to do something active every day, but specifically, I'm setting the goal as two parts: (1) hit 5,000 steps daily and (2) use the treadmill every single day. To be honest, I'm not going to use it every day. It just won't happen, my schedule won't allow it, but if I set a goal for less often than that, I'll slack off even more. My brain is weird. By setting the goal as every day, I think I'll hit at least 20 out of 28 days. The 5,000 steps every day is much more likely to actually happen, because I currently do that most of the time anyway. There are days where it's less, but it's always close, so I just need to be more mindful and make sure the count always hits 5,000. Yes it should be 10,000 but I don't wear a tracker so mine are only counted when I've got my phone on me. Spend less than I did in January. I just ended up getting a lot of gifts at once, so I'm hoping that won't come up again in February and that total can be less. Get back up to date with the blog. I had no time to blog or respond to comments while my mom had her hip surgery at the end of the month, so I'm still a little behind. I need to catch up on that stuff and start writing some posts ahead of time so I don't feel so rushed all the time. Declutter and organize both bathrooms. Mine isn't bad, John's can get that way. I plan on getting both cleared out! Valentine's Day. I love all holidays, including Valentine's Day. And this year, since John is on furlough, he's actually not working on the actual holiday or the early morning the day after. I don't know what we're going to do but we'll definitely plan something. A Quick Tara Visit. We have actual visits planned for the rest of the year, but she'll be in town for work at the end of the month, so we can meet up for lunch, which will be fun. Losing at least 4% of my body weight so I can win the DietBet with Megan. Wishing all of my friends a happy birthday, and being thankful we're past the age where we keep giving presents for everything.